It's all Rick Riodan all the time over here. Actually, it has never not been Rick Riodan time since we discovered The Lightening Thief. Almost every conversation has to do with Greeks, Romans, and monsters. Henry: "Do you think satrys can find demigods if they are homeschooled?" Yes those are the names from characters in The Lightening Thief series. Got James some rec specs for soccer. There is only one word for this. Awesome. So excited to announce the first Open House for LMCA! Please pass this along to any and all local homeschoolers. This is going to be an amazing program. All we need are some families! Tour Our Engaging, Beautiful Facility! Hands-on Science Activity for the kids! Find out more about how our two day/week program can benefit your homeschool child and support you! We offer classes for grade K-8 in history, science, technology, writing, literature studies, and math enrichment all for a reasonable tuition rate. Classes meet Monday and Wednesday from 9:00 am until 2:00 pm to enrich and support your traditional homeschool program. We may be just the alternative you are looking for! Here are some photos from our facility to help lure you in! This blog may be kind of quiet next week as James and I are heading out to Arizona to visit the Grand Canyon! A special birthday gift from his grandparents. I have some scheduled posts and hope to be able to post from my iPhone, but the blogger app doesn't always work well for me. 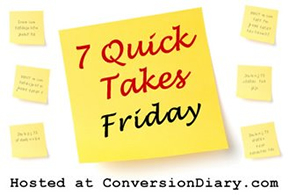 Check out more Quick Takes over at Conversion Diary!